The tablet arena already includes countless contenders featuring Linux-based Android, but a company currently seeking funding on Indiegogo aims to produce a new line of what it calls “true Linux” devices. We've already seen Linux-powered tablets including the Vivaldi and the rugged Trimble Yuma, of course, but the new PengPod line from Peacock Imports includes both 7- and 10-inch tablet models as well as a mini PC, all running the free and open source operating system. “Our goal is to build a powerful, True Linux Tablet, one free of Android's restrictions, at a reasonable price,” the company explains. 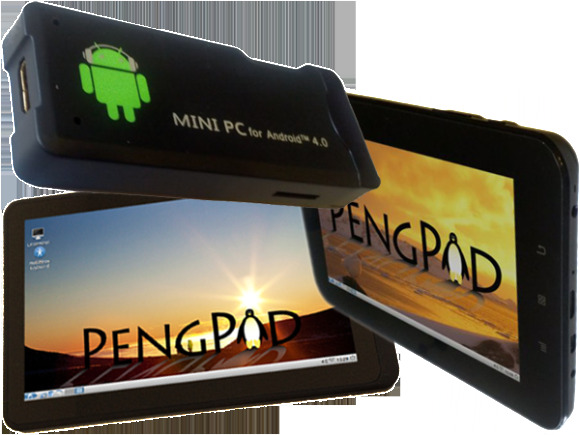 All three devices in the PengPod line feature the Allwinner A10 system on a chip and come with the user's choice of Linux or Android 4.0. The $85 PengStick, for instance, is a 3.5-inch mini PC much like the MK802 that comes with 1GB of RAM, 4GB flash storage, and WiFi. The diminutive device includes a power supply, a USB OTG adapter, and a mini HDMI-to-HDMI cable, and can run Linux from an SD card. For $5 more, you can have Linux installed on the on-board flash; an extra $8 gets you an 8GB Linux SD card for dual booting. The PengPod700, meanwhile, is a 7-inch tablet featuring Android on flash and a bootable Linux SD card as well as a capacitive touch screen, 1GB RAM, 8GB flash, speakers, and a front-facing camera. A $99 early-bird offer has already expired, so the device is now priced at $120. Last but not least, the 10-inch PengPod1000 tablet is priced at $185. Preorders are now being accepted on Indiegogo. Estimated delivery on all three devices is January 2013. The video above offers a glimpse of the devices in action. Of course, only time will tell whether the company's $49,000 funding goal is met by its Dec. 2 deadline--as of this writing, it's reached just $16,414--allowing production to begin. Still, the prospect is a compelling one, and it fits right in with the Linux-powered revolution that's been going on. If you're a fan of Linux in particular or low-cost devices in general, you may want to check out this new option.